In today’s world, environmental issues are a topic of concern for many people. The effects of pesticides and the use of fertilizers are big topics. There is always a negative and a positive side when it comes to such subjects. We all changed our views at times and Lawn Care Academy has become more organic minded, with a focus on what actually works. Sadly, in our world today, both sides of the debate seem to have little integrity. Exaggerations of damage and non-damage seem to be the standard when defending their causes. Truth doesn't matter, but rather the focus is on who can win. On the positive side: There are many wonderful benefits of lawn grass. The tremendous amount of oxygen our lawns create far out weigh any negatives. Lawn grasses clean the air, stop erosion, add beauty, and cool the environment. You can see many other wonderful benefits lawn grasses provide by looking at our page on Grass Care Facts. On the negative side: There probably would not be much concern about the environment if the harmful effects of pesticides were not a real concern. Evidence of effects of pesticides, such as chemical runoff, have shown up in samples. Some people are asking the question of whether or not we should even have lawns. Fortunately, most problems are not the result of home lawn care. The largest problems can be traced back to materials used on field crops, or from deliberate misuse and dumping. Performing tests on the effects of pesticides and fertilizers are required by State and Federal Regulations before products can be released to the market. Universities for many years have been conducting research on the harmful effects of pesticides in the environment. The United States Golf Association (USGA) and the Golf Course Superintendents Association (GCSAA) for over 20 years have been studying the environmental effects of golf course maintenance. They have worked hard at refining their methods and making the results available to the public. You can see current research and environmental issues by going to the USGA Turfgrass and Environmental Research Online website. Here you can read back issues dating back to 2002. You will find a lot of helpful research and advice in many areas of turf maintenance. The fate of fertilizers and pesticides on the environment as it pertains to home lawns is very different from that of field crops. The reason for this is that grass forms a thick covering and barrier along with the roots. Contrast that with field crops where materials often fall on bare soil. In studies, well over 90% of pesticides are trapped and never escape past plant root systems and almost 100% is trapped where thatch is present. Spot spraying weeds using a hand-held or backpack sprayer is a good way of reducing pesticide use. This method sprays the weeds and not the entire yard. As you work on thickening your lawn, weed problems will be less. Fertilizers are being developed with safer ingredients and for gradual release. Organic products are also getting greater attention. Organic fertilizers rely on soil microorganisms to break down organic matter into elements that are able to taken up by grass roots. One word of caution, however, organic does not always mean “safe”. If you are uncertain about a product, always do a little research to make sure it is safe to use. Even with all the advancements being made, we need to be careful to avoid any negative effects of pesticides. When talking to homeowners, a common mistake is to think that if a little works well, then a lot must work better. This does more harm than good and you could even harm your grass. Try to determine the amount of product you need before mixing and do not dump any extra material left over after spraying. If a little product is left, use the product on the lawn or save it for a future application. Certified Applicators must be tested by the state on their knowledge of the effects of pesticides, safe handling, on State and Federal laws, etc. Many are more than happy to help homeowners. I am always delighted to meet homeowners and show them how to work safely with chemicals. They are always thankful for the help and I want them to be safe. Be sure to always wear all the required protective equipment stated on the label and keep animals and children off the lawn for the amount of time specified. When contamination has occurred, the EPA tries to determine where the harmful effects of pesticides and other chemical contamination had originated. It is sometimes difficult to determine the source of the contamination, but it will either be a “point-source” or “non-point-source” contamination. Point-source means that the point where the contamination occurred is clearly identified. A company that dumps chemicals into a river is an example. Another example is when a chemical truck overturns and its contents are spilled. A less dramatic example is when excess chemical in a home sprayer is dumped so the sprayer can be used for something else. An example of non-point-source contamination could be when a chemical was applied correctly, but the chemical moved off target into a sensitive area such as a near-by stream. Non-point-source is the most difficult to identify. It is also the source that is most often blamed for environmental contamination, especially by groups trying to ban all pesticides. Environmental studies, including those done by the EPA, have revealed it is the opposite. It is point-source contamination, where the source is clearly identified, that is found to be the primary contributor to environmental pollution. Pesticides used on home lawns, when used according to directions, rarely cause any contamination problems. When considering the effects of pesticides, keep in mind that not all chemicals are created equally. Different words have been used to describe certain aspects of chemicals and pesticides. Many factors play a part in determining the severity of the contamination such as toxicity and how long the active ingredient remains active. Some chemicals are not very toxic, but remain active for long periods while others are more toxic, but break down quickly. The combinations can vary considerably. Persistence- refers to the length of time the chemical remains active after it is applied. Some chemicals remain active for long periods, such as some household insect spray. 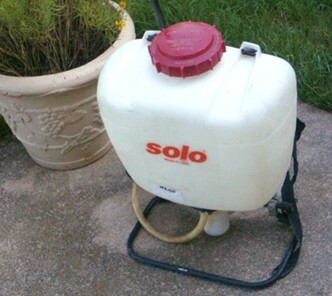 Many outdoor chemicals have short persistence or are non-persistent. Non-persistence- means it controls on contact and then quickly deteriorates. A feeling is that the negative effects of pesticides are less with non-persistent pesticides. The product with the common name of "Round-up" is an example of a non-persistent chemical. Once sprayed, it is absorbed into the grass. Any chemical that missed the plant is quickly broken down by soil microorganisms. However, this primarily applies when the microorganisms are active. For example, if Round-Up is sprayed in early winter to kill certain cold weather weeds, the chemical touching the soil may be slower to breakdown. As a general rule, for people concerned about reducing the harmful effect of pesticides, timing is important along with choosing chemicals with short persistence. You are part of the environment. Before using any product, be sure to read the label and notice any "signal word" on the front label. Signal words are an indication of the product's toxicity to humans. There are three primary signal words. “Danger”, “Warning” and “Caution”. There is also the Skull and Crossbones symbol which always accompanies the words “Danger” and “Poison”. Obviously, the stronger the signal word the greater the chances of encountering harmful effects of pesticides. These words are not only for pesticides, but are words that must accompany many household products as well, such as hairspray, mouthwash, kitchen cleaners, etc. Some products have multiple combinations of signal words: For example, some products, the “Danger” or “Warning” label may apply if inhaled or swallowed, but reduced to “Caution” if exposed to skin. It is very important to read and follow all label directions and to wear the required protective clothing listed. Danger/Skull and Crossbones/Poison- Indicates that this product is highly toxic and should be handled carefully. Gasoline, for example, carries this label and is a product we use everyday. Danger- This is a signal word that means the pesticide or product is highly toxic. These products should not be swallowed, inhaled or exposed to skin. It may indicate that it will cause serious eye irritation. Some pesticides have a time period following an application when children and pets are not allowed on the yard. If allowed onto the yard before the safety period ends and come in contact with the pesticide, it could result in exposure. Carefully follow safety guidelines. 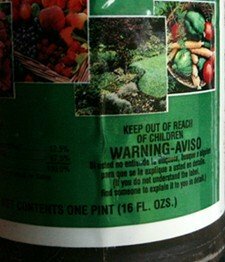 Warning- This is a word that signals the pesticide or product is moderately likely to cause acute illness if swallowed, inhaled or exposed to the skin. It is also likely to cause moderate eye irritation. Caution- This is a word that signals the product is slightly toxic or relatively non-toxic. 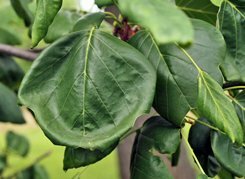 It has only slight potential to cause acute illness if swallowed, inhaled or exposed to the skin. The skin or eye irritation it would cause would be less than those with other signal words. These words are not intended to replace common sense and reactions could be worse for some people. Always read the label and if you are ever in doubt, take greater precautions or use another product. Note: For detailed help in learning how to use herbicides and other pesticides safely, be sure to read the page on Using Herbicides Safely. If you have had little experience using pesticides or are unfamiliar with how to use them safely, this is an important page to view. It is also a great refresher page for the more experienced as well. In the world of turf grass, understanding plant structure and growth can reveal keys to a beautiful lawn. Understanding how to use herbicides safely is a prerequisite to using them. This pages gives you sound information that is broken down in an easy to read format.